Glasgow Defence Campaign: Support Barbara Dowling! Oppose the CACI Census! Support Barbara Dowling! Oppose the CACI Census! The first person to be tried for non-cooperation with Scotland's 2011 census appeared in Glasgow Sheriff court this morning. To a court audience, which included a reporter from a Scottish News Channel, Barbara Dowling, who is pleading not guilty, defended her right to represent herself and opposed the Crown’s motion to adjourn the trial to a later date. The crowns reasons related to another case in which a defendant had been interviewed without legal representatives. The judge complied with the Crowns’ motion and has set new dates for Barbara’s case (see bottom of report). This comes as part of a widening attack on the right to protest which is being challenged on a national level. On the 1st March the GDC will be supporting a Fight Racism! Fight Imperialism! activist who is challenging police kettling in Glasgow district court. Of the thousands of Scots who didn’t fill in this intrusive census Barbara has been one of the few who has been picked out for prosecution. Why? 1) She has been targeted as a political activist. Yesterday Barbara was given a supervision order by Dumbarton Sheriff Court in response to her non-payment of a fine arising from her part in a blockade of Faslane naval base. 2) She is opposing the census on political and moral grounds. She has objected to the use of CACI - a defence contractor that had been involved in human rights abuses at Abu Ghraib Prison in Iraq - to carry out key census work for the Registry Office of Scotland (now National Records of Scotland). Chair of Scotland Against Criminalising Communities (SACC) Richard Haley has condemned the targeting of Barbara stating; "It's completely unjust for a tiny handful of people to be dragged through the courts when everyone knows that thousands of Scots binned their census forms. Barbara has been singled out for reasons that at best are arbitrary, and at worst look like blatant political victimisation. When the law is applied as selectively as that, it isn't a law at all, just a vehicle for official whims. "But what really sticks in the gullet is that CACI has ducked the law altogether over it's involvement in abuses at Abu Ghraib. Former Iraqi prisoners have been trying for years to bring a lawsuit against CACI in the US, but CACI has blocked their efforts, claiming immunity as a US government contractor. 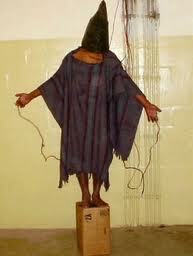 And in Scotland in 2009 the Crown Office refused to prosecute CACI over Abu Ghraib. Their reasons were confused and technical. But almost no one except the Director General of the Register Office has ever suggested there's any lack of evidence. How can the Crown Office have the gall to prosecute Barbara and people like her while it ignores evidence of torture and other gross abuses?" Supporters of the SACC, Fight Racism! Fight Imperialism!, the Glasgow Defence Campaign and Palestine solidarity activists attended the trial in support of Barbara’s courageous stand. The GDC calls on other progressive groups in Glasgow to end their boycott of solidarity protests for activists being victimised by the police and courts. Justice for the victims of CACI’s torture! Unity 4: Another victory in Glasgow!